Kanye West met with Donald Trump on Tuesday — and was apparently impressed enough to postpone his own plans to run for the American throne. The rapper — a vocal Trump supporter who had vowed to run for America’s highest office in 2020 — sat down for a 15-minute conversation with the President-elect inside Manhattan's glitzy Trump Tower. 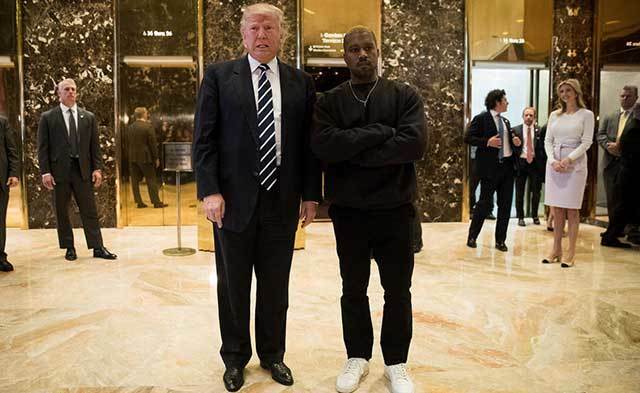 Trump and the “Watch The Throne” artist posed for photos together in the lavish high-rise's golden lobby after their short discussion, with Trump cryptically telling reporters that they spoke about "life." “We've been friends for a long time,” Trump said. But later in the day, West sang a far different tune. "I wanted to meet with Trump today to discuss multicultural issues," West began in a series of tweets. "These issues included bullying, supporting teachers, modernizing curriculums, and violence in Chicago. I feel it is important to have a direct line of communication with our future President if we truly want change." He was apparently so moved by his meeting with Trump that he was willing to concede the next election, concluding his social media missive with the hashtag #2024. West made waves early Tuesday morning when he showed up at the Trump Tower with a sprawling entourage — including his own cameraman — and hustled through the lobby before disappearing into an elevator. He emerged downstairs soon after with Trump by his side, with the two exchanging a handshake before parting ways. Notably absent from the scene was West's wife Kim Kardashian, who supported Hillary Clinton in last month's election. "She respects her husband," a source told Us Weekly. "Kim knew Kanye was on this trip. She's not surprised by this. Kim knew that Kanye supported Trump before this. Kim and Kanye definitely differ on their opinions — obviously, she voted for Hillary." The surprise meeting took place after West, 39, requested to sit down with the soon-to-be commander in chief, and Trump obliged, according to TMZ. Their conversation covered the possibility of West becoming an "ambassador of sorts" for Trump, with the rapper potentially taking on some type of "entrepreneurial leadership role," a source told E! News. There's been considerable speculation in recent days about which musical artist will perform at Trump's inauguration next month, though West declined to reveal whether that had been discussed. The commotion at the Trump Tower comes weeks after West was booed at his San Jose, Calif., concert for revealing he would’ve voted for Trump — had he bothered to cast a ballot in last month’s presidential election. He then referred to Trump multiple times during his now-infamous rant two days later at his show in Sacramento, which he ultimately ended early after performing just three songs. West — who was recently hospitalized for more than a week after a nervous breakdown — first declared at the 2015 MTV Video Music Awards that he intends to run for President in the next election — a promise he's reiterated multiple times. His lyrics, such as “2020 I’ma run the whole election” in his hit song “Facts,” reflect that. West jetted to Manhattan on Monday in hopes of finding a psychiatrist to add to his medical team, TMZ reports. He was reportedly accompanied by several of his West Coast-based doctors on the cross-country venture from Los Angeles with the intention of interviewing psychiatrists to become his main shrink while he's on the East Coast. The "Famous" rapper continues to receive daily medical attention from his current team of exclusively West Coast doctors, who have placed a tremendous focus on making sure West takes his medication, according to the celebrity gossip site. West had reportedly stopped taking his prescribed dosage of medication before last month's trip to the hospital. The trek to New York appears to be West's first trip outside of Los Angeles since he checked out of the UCLA Medical Center, where he was taken in late November after displaying disconcerting behavior reportedly stemming from exhaustion and dehydration. West's stay at the hospital ended up lasting longer than doctor's originally anticipated, however, as the rapper struggled with long-standing issues of paranoia and depression, according to TMZ. The eight-day hospital stint took place a few days after West unleashed his fuming rant at the Sacramento concert, where he sounded off on Jay Z, Beyoncé and the music currently played on the radio in addition to referencing Trump. West canceled the remaining 21 concerts on his "Saint Pablo Tour" two days later — hours before he was taken to the hospital. Since being released, the "Fade" artist has devoted his time to activities that don't cause him stress, like remodeling the Hidden Hills mansion he owns with wife Kim Kardashian, according to TMZ. He reportedly made time to speak to designers and architects while in Manhattan.